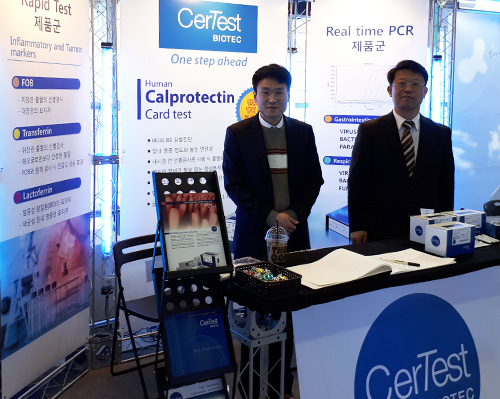 UNION LAB, INC., CerTest distributor in North Korea, participated in the last edition of the KSLM Annual Conference, on April 13 and 14. In its exhibition space, all visitors have been able to find and know the solutions CerTest offers for the in vitro diagnosis of infectious diseases, both through the Rapid Test line, based on immunochromatography, and the latest VIASURE Real Time PCR Detection Kits for the detection of pathogens by amplification of DNA strands. En palabras del equipo de UNION LAB, INC. asistente en el evento, “la feria ha supuesto un gran éxito para nosotros“. The next stop, within the annual event tour in which CerTest participates, will be the AACC fair in San Diego, USA, from August 1 to 3. Stand nº 5013.